Turnstone believes in possibilities and these extend to all people with disabilities, no matter where they live. As our programs and services have grown so has our reach and for the past three years, Turnstone has been fortunate to be a participant in the U.S Department of State’s Global Sports Mentorship Program, hosting five adaptive sports employees from five foreign countries. During their time with Turnstone, they meet our clients and our staff and learn best practices in serving and empowering people with disabilities. Following the conclusion of this year’s Global Sports Mentoring Program, Turnstone’s Director of Outreach, Tina Acosta, was given the opportunity to travel to Paraguay and spend time with Leti Houdin Baez, who had joined Turnstone through the GSMP program earlier in the year, to support what she had been able to learn and take back to her home country, to engage with local leaders and participants, to learn from their culture and to reinforce the GSMP global network. Read on to hear some of Tina’s experiences during her time in Paraguay. W hen we arrived at the US Embassy and met with Gilda Mariotti-Gauto, Information Specialist in the Public Diplomacy Department, and Kathleen Guerra, Public Affairs Officer in the Public Diplomacy Section, I was moved by their eagerness to learn about Turnstone. It was obvious they are fellow champions of empowering people with disabilities and fully support the groundwork Leti has laid for improvements and future goals. 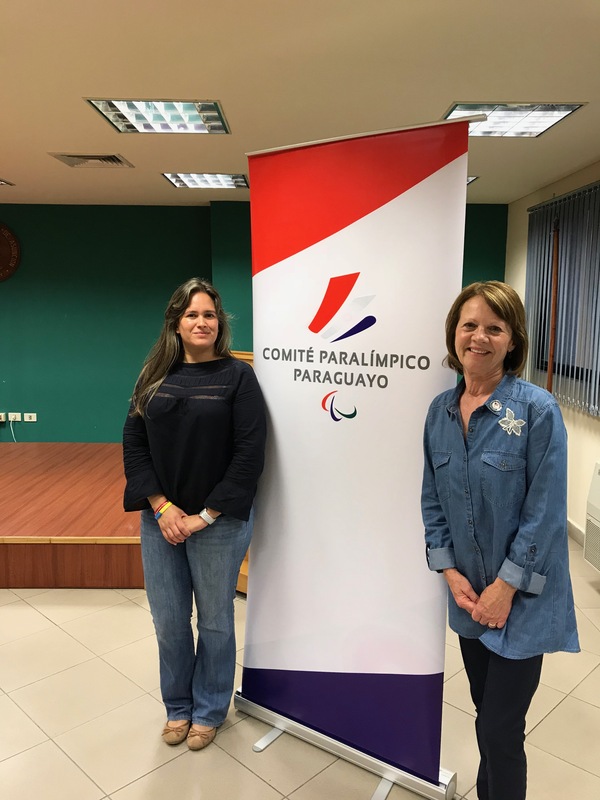 It was exciting to see their vested interest specifically in the future of Paraguay’s Paralympic Movement. This interaction was a clear glimpse into how the Global Sports Mentoring Program helps to cultivate and empower international change makers. They connect them with resources and partners, like Turnstone, to help them enhance the momentum they have created in their mission to make a positive impact in their home countries. I was also given the opportunity to present to sports management students at Universidad Autonoma De Asuncion, a local university. I shared the programs and services that we offer in pursuit of our overall mission to empower people with disabilities to achieve their highest potential. I also introduced them to people-first language, other disability awareness principles, and the role they can play in advocating for people with disabilities. I wondered if my message would be lost in translation or if the rhythm of my presentation stalled by the required translation into their native language would overshadow the information I wanted to share with them. However, at the close of the presentation, based on feedback from one of the instructors, it was clear that the important work of empowering and advocating for people with disabilities is a universal message. These two experiences were two bright spots amongst countless interactions that opened my eyes to the incredible opportunity the GSMP offers to participants both of foreign countries and to those of us in the United States to create positive change across the globe. With the right people working together to build mutual partnerships, lives are changed. That is the reality of the Turnstone of Today—playing an international role in promoting and creating opportunities for sports and athletic opportunities for people with disabilities. These efforts align with our partnership with the United States Olympic Committee in our support of the US Paralympic Movement. Beyond that, these efforts are also resulting in a growing global movement of growth in the Paralympic movement on the whole. Regardless of what country we call home, this work is important. It is about dignity, respect and value and it’s the right thing to do. Turnstone is not alone in our goal to ‘create possibilities.’ Perhaps, sport is one of our most powerful tools to promote equality and inclusion around the world. Today these possibilities are limitless and we are honored to play a part in creating sports opportunities for all persons with disabilities throughout the world.